The outdoor modern art exhibition has been held at Rokko Island Marine Park, located on the southern edge of the man-made island every year since 1993 (except 1995 because an earthquake destroyed the park). 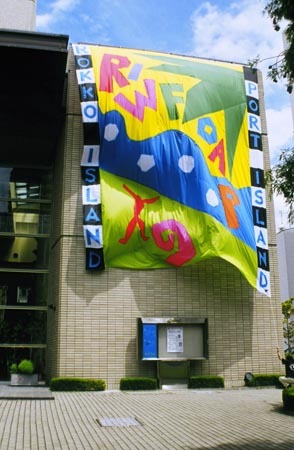 In 1999, art that connected Port Island and Rokko Island was exchanged. I made a big, (7m x 8m) flag and it was hung from the top of the building. That flag showed how dynamic the fabric was by making the flag wave on the side of the building.